Net Profit for Q1 of 2017-18 fell by 3.3 per cent. Revenue for the quarter also fell by 0.2 per cent as compared to last year. Sikka inherited a company under tough times. Adverse market conditions, shift to automation, AI, robotics and digital hitting it badly. But total revenues increased from $8.2 billion to over $10 billion during Sikka’s tenure. Attrition was down significantly. Corporate tussles have rarely been as public as the one between Infosys founder and former CEO N.R. Naray­ana Murthy and MD and CEO Vishal Sikka. That wrangle, which led to the latter’s resignation, has brought to focus many issues at the company which once led India’s IT sector. What began with matters related to compensation packages to senior executives, including Sikka, has boiled down to issues of corporate governance and the way the company is being run, something Narayana Murthy has objected to and blamed the present management for. The ‘drumbeat’, as we know, has been over the unheard-of severance package given to ex-CFO Rajiv Bansal and the $200 million acquisition of Israeli tech firm Panaya in 2015. Following Sikka’s resignation on August 18, Narayana Murthy has been made a villain for his constant needling of the CEO and the management, but his concerns about Infosys’s performance in the last three years has been largely ignored. For Infosys, the Sikka years have been marked by bad performance, low growth, negative quarterly revenue growth and a continuous drop in net profits. The stock price of the company also took a severe beating. While Narayana Murthy has been the chief objector, other promoters have also toed his line and publicly called into question the wisdom of decisions taken by the present management and board. 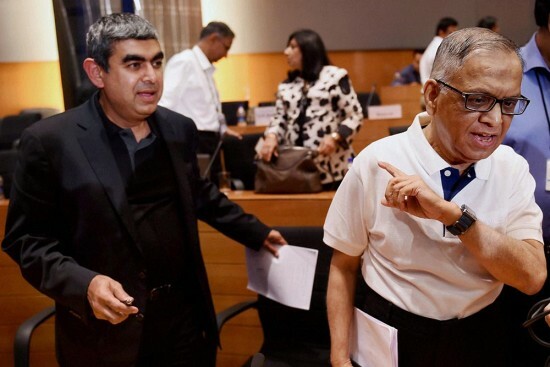 Two issues—a lavish severance package for two employees who left Infosys and the slightly-more-than-lavish compensation package of $11 million (over Rs 73 crores) per annum for CEO Vishal Sikka, particularly rankled. Infosys promoters feel that the over 40 per cent spike in Sikka’s compensation from this January was not justified, especially in the light of Infy’s performance under him. Also, Sikka’s stint has now spanned about three years, long enough for an appraisal of his helmsmanship. Other than facing a decline in deals from Western clients, Infosys is also gearing up for changes in US visa rules. The tussle also came at a tough time for the $150-155 billion Indian IT services industry. Like others in the sector, Infosys, India’s second largest domestic IT firm, faces a decline in new deals from clients in the West, the US in particular. Furthermore, the industry is gearing up for changes in work visa rules in the US, Indian IT’s largest market—which potentially can really dent industry numbers. It’s true that the market environment is different from the time Narayana Murthy or Nandan Nilekani led the company. The sector has moved fast towards automation, digital and artificial intelligence, things the Indian IT industry, including Infosys, have been slow to embrace and where they are fast falling behind the curve. This is where leaner, nimbler firms are garnering revenues through smaller, but more numerous, contracts. In recent quarters, Infosys’s growth rates have dipped to single digits, with the weather forecast showing endless cloudy skies. In October 2016, it cut its annual revenue growth target for the second time in three months as major clients held back on spending. While 2016-17 saw indifferent to negative results, the last two quarters have been particularly bad—Infosys reported a 3.3 per cent seq­uential drop in net profit at Rs 3,483 crore for the first quarter of 2017-18. It had reported a Rs 3,603 crore profit for the period last year. Quarterly revenue also dropped 0.2 per cent, to Rs 17,078 crore, compared with Rs 17,120 crore last year. The recent past is equally discouraging. In the fourth quarter of 2016-17 (ending March 31), the company reported a 2.83 per cent drop in con­solidated net profit at Rs 3,603 crore, compared with Rs 3,708 crore posted for the sequ­ential quarter ended December 31, 2016. Consolidated revenue dec­lined 0.89 per cent quarter-on-quarter (QoQ) and 3.44 per cent year-on-year (YoY) to Rs 17,120 crore. Before that, in the Dec­ember 2016 qua­­rter, net profit grew by just 2.8 per cent while revenue dipped by 0.2 per cent. In fact, the quarters under Sikka’s leadership have been marked by low revenue, as net profit growth went into the negative many times. He has not had a single double digit revenue growth quarter. Worse, Infosys gave an extremely subdued single digit guidance for FY 18, projecting a revenue growth of just 6.5-8.5 per cent. Another top IT firm, Cognizant, gave a better growth projection of 8-10 per cent growth during 2017. In contrast, N. Chandrasekharan, then CEO of TCS, performed much better under similar circumstances. Under him, TCS’s revenues jumped threefold, from $6.34 billion in 2010 to $16.5 billion in 2015-16. Its profits during it also rose threefold—from Rs 7,000 crore to over Rs 24,000 crore in the same per­iod—and exports alone touched $10 billion. “Sikka’s allegation that he was continuously being distracted does not wash, as he had a long honeymoon per­iod to make his mark,” says V.K. Sharma, head, PCG, HDFC securities. Given the dire situation, Infosys needs an old hand who can turn around its fortunes. Like Nandan Nilekani. To be fair to Sikka, under him, Infosys’s revenues increased from $8.2 billion to over $10 billion. Simultaneously, attrition—the bane of the software sector and an area of concern for Infosys—came down from a high of 23.4 per cent. Infosys is also sitting on cash pile of $6.1 billion, up from $4.9 billion at the time when Sikka took over. Yet, Balakrishnan has often pointed out that the Infosys stock price has been languishing for long. “From the shareholder’s point of view, the stock hasn’t moved anything material in the last three years,” he says, adding that growth has slowed in the industry and some other parameters, like per capita revenues, are flat. Of course, margins have been protected and attrition has come down. “So, there are pluses and minuses. But, I think, performance is something the Board has to look at. We don’t have any view,” says Bala­kri­shnan. The core issue, he still maintains, is that the present Board members don’t have “skin in the game”. “The frictions still remain, the concern still remains. So, the first step is to reconstitute the Board, fix all governance issues, create checks and balances, then look for a CEO.” And there’s no reason why the inquiry reports, (an issue pointed out by Narayana Murthy) shouldn’t be made public, he says. Of course, with performance subdued to say the least, Infosys is facing problems on all ends. On the one hand is the internal investigations over the acq­­ui­­sition of Panaya; on the other, three US law firms have initiated investigations against it and one of them is preparing class action lawsuit over concerns that Infosys may have issued “materially misleading inf­ormation” to investors. According to a research paper from Ambit Capital, Infosys is now mired in uncertainties over corporate governance, class act­ion lawsuits, succession planning, long-term strategy and titleholder attrition. Could this lead to some founding members, considered more non-aligned, to return and save the day? Given the developments, it may be difficult for Infosys to find a new CEO, especially from outside. What it needs is an experienced hand who can pull the company from its present condition and put it on a growth track commensurate with the developments in the industry. On Wednesday, some of the investors in Infosys wrote to the company board, proposing that Nandan Nilekani be brought back to the board to save the company. That may be its last hope, given the difficulties the company is going through both in terms of governance and performance. In case Nilekani comes in, investors would be happy and the stock would surely gain at the markets. But it would remain to be seen what he can bring out of the hat to put the beleaguered company on a growth track again.